A raging, unhinged Donald Trump threatened Hillary Clinton with prison during a presidential debate unlike any other. But corporate media pundits said he won. 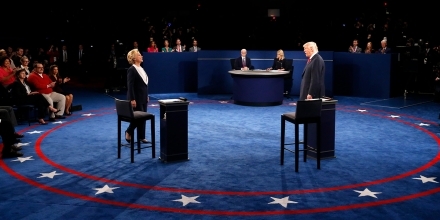 Jon Schwarz – Oct 10 2016, 3:43 a.m.
Before tonight’s debate, ABC and CNN agreed with the Open Debate Coalition, an organization made up of Democrats and Republicans of widely different views, that they would consider asking Hillary Clinton and Donald Trump some of the 30 highest-voted questions on the Open Debate website. Anderson Cooper and Martha Raddatz appear to have broken that agreement in a fairly spectacular way. This next question comes from the public through the bipartisan Open Debate Coalition’s online form where Americans submitted questions that generated millions of votes. This question involves WikiLeaks’ release of reported excerpts of Secretary Clinton’s paid speeches, which she has refused to release, and one line in particular in which you, Secretary Clinton, reportedly say you need both a public and private position on certain issues. So Tiu from Virginia asks, is it OK for politicians to be two-faced? Is it acceptable for a politician to have a private stance on issues? However, this was not one of the 30 most popular questions — most of which involved large public policy questions, such as gun control, Social Security, and global warming. Update: The question asked by Raddatz was in fact submitted to the Open Debate website and appears here. Only 13 people voted for the question to be asked at the debate. By comparison, over 75,000 voted for the most popular question, about background checks for gun sales. Over 20,000 voted for the 30th most popular question. At https://t.co/LGuYG6MNsh, over 3.6 million votes were cast on over 15,800 questions. Tonight, the one they used received 13 votes.